Users are reminded to refer to AIP Supplements and NOTAMs to obtain the latest information. Aeronautical Information Publication, AIP Supplement and Aeronautical Information Circular provided in this website are controlled documents. They are uncontrolled when printed, copied or downloaded. • Users are reminded to refer to AIP Supplements and NOTAMs to obtain the latest information. • Aeronautical Information Publication, AIP Supplement and Aeronautical Information Circular provided in this website are controlled documents. They are uncontrolled when printed, copied or downloaded. Click here to subscribe / unsubscribe the free email notification service. To register/cancel the free email notification service, please send us a registration/cancellation email in the format as specified in the next page. The registration/cancellation emails are handled automatically by the system. Any other information contained in these emails or emails not conforming to the instructions will not be processed or otherwise handled. Please DO NOT include your name, organization, post, phone number or any other personal particulars in the registration/cancellation email. Each email address shall be separately registered/cancelled. By submission of the registration email, you consent to receiving emails through the email address you provide in relation to the free email notification service. You should check your email account regularly to ensure that the account is operating normally and is able to receive incoming emails. Notification emails sent to you are for information only. 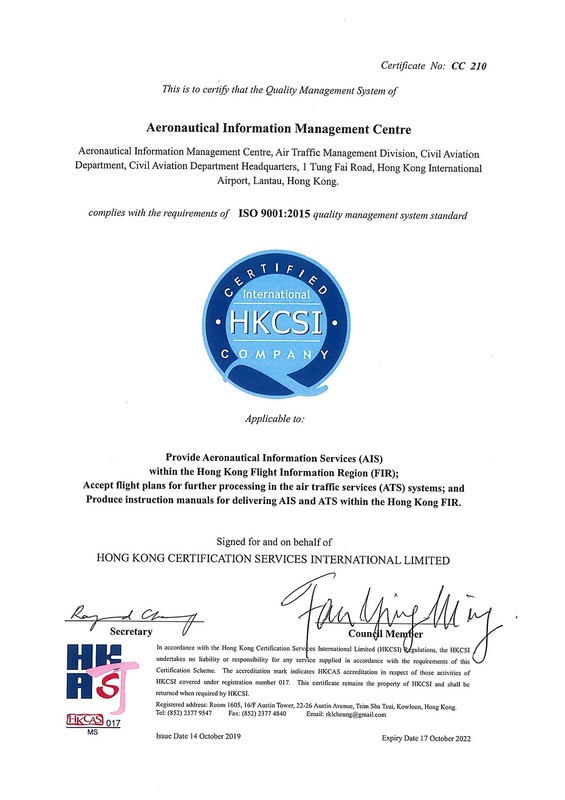 You are advised to visit Hong Kong Aeronautical Information Services website from time to time for the current aeronautical information publications and circulars that you are interested in. You have the right to request access to and make correction of personal data you provided in accordance with Section 18, 22 and Principle 6 of Schedule 1 to the Personal Data (Privacy) Ordinance. Please contact us through hkais_notification@cad.gov.hk . To maintain smooth functioning of the service and data integrity, the Government reserves the right to remove any email address from the distribution list without the prior consent of subscribers. The Government is not liable for any delivery failure of notification email and legal liability for any delay, any indirect consequences or damages resulting from the use of the subscription service. By ticking this box, it indicates that you agree with the above terms and conditions. If you want to subscribe, please Click here to register and send us an email. If you want to cancel the free email notification service, please Click here to cancel subscription and send us an email. If you are unable to send the subscription email by clicking the buttons above, please send an email directly to hkais_notification@cad.gov.hk . Please type “HKAIS Notification Service – Subscribe” in the subject of the subscription email. If you want to cancel the free email notification service, please type “HKAIS Notification Service - Cancel Subscription” in the subject of the email. If you want to subscribe or unsubscribe the free email notification service, please send email directly to hkais_notification@cad.gov.hk . Please type “HKAIS Notification Service – Subscribe” in the subject of the subscription email. If you want to cancel the free email notification service, please type “HKAIS Notification Service - Cancel Subscription” in the subject of the email. The information contained in this website is provided by the Civil Aviation Department Hong Kong ("CAD") for general information and reference only. Whilst the CAD will endeavour to ensure the accuracy of the information in this website, the Government of HKSAR and the CAD do not guarantee or warrant that such information is accurate. Moreover, the inclusion of hyperlinks to other websites is only to facilitate cross-reference. The Government of HKSAR and the CAD expressly state that they have not approved or endorsed the content thereof. Users shall verify information obtained in this website by making reference to other sources when making material decisions. The Government of HKSAR and the CAD are not responsible for any loss or damages incurred for any cause whatsoever in relation to or as a result of the use of the information in this website. The copyright and all other intellectual property rights in the information of this website belong and are reserved to the relevant owners. The Government of HKSAR and the CAD shall not be liable for any loss incurred or damages suffered by any person as a result of any actual or alleged infringement of copyright or other intellectual property rights. The content available in this website, including but not limited to all text, graphics, drawings, diagrams, photographs and compilation of data or other materials are protected by copyright. The Government of the HKSAR is the owner of all copyright works contained in this website. Any reproduction, adaptation, distribution, dissemination or making available of such copyright works to the public is strictly prohibited unless prior written authorisation is obtained from the CAD. •	Materials in specific formats, including but not limited to certain aeronautical charts. The Government of the Hong Kong Special Administrative Region ("the Government") is concerned to ensure that all personal data submitted through the website of the Civil Aviation Department (CAD) are handled in accordance with the relevant provisions of the Personal Data (Privacy) Ordinance. The Government will record visits to this website without collecting any personal identifiable information of users. Such general statistics are collected for the compilation of statistical reports and the diagnosis of problems with or concerning computer systems to help improve this website. For different purposes and at different times you may be invited to provide personal data to the Government through CAD website on a voluntary basis. Personal information may include name, telephone number, mailing address or e-mail address. The Government will specify the collection purpose and intended usage of your data when it invites you to provide such information and advise you how you may request access to or correction of the personal data provided. Unless permitted or required by law, the Government will not disclose your personal data to any third parties without your prior consent. Search service on CAD website is provided by GovHK. We are advised by GovHK that it does not collect personal identifiable information while serving search results through www.cad.gov.hk. GovHK will share the anonymous data it collects through the search service with the Government for compiling traffic analysis on government websites. The Government will not match the data obtained from any such search activity with any personal data possibly held by the Government.